Before it became a sugar mill, Central Plazuela was a Hacienda or Ingenio when owned by Cornelio Kortright during the second half of the 19th Century. It is not clear how Kortright became owner of Hacienda Plazuela but it could very well have been willed to him by Englishman R. C. Reynolds . The firm Balseiro & Gerogetti leased the hacienda in 1889 and acquired it in 1894. 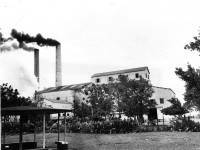 In 1896 new machinery was added converting Plazuela into a Central sugar mill. 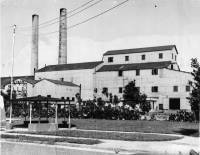 In 1911 a new steel building was constructed for the boiling house where new vacuum pans, boilers, crystalizers and centrifugals were installed. Eduardo Georgetti (1866-1937) was one of the most influencial sugarmen of the early 1900s in Puerto Rico. Plazuela was his main operation but at one point in time or another, he also had interests in Centrals Camuy, Cambalache , Carmen , Los Caños, and Plata . Georgetti was married to Aurea Balseiro Davila, daughter of Ramón Balseiro Maceira (1833-1902), a Spanish immigrant who had arrived in Puerto Rico in 1836. Ramón was Georgetti's partner in the firm Balseiro & Georgetti and was in charge of field operations, his brothers Agustín and Rafael were in charge of the factory and accounting respectively. When we visited Plazuela, we were told by people who claim to have worked at the sugar mill, that the cone shaped structure pictured was the sugar mill's laboratory, which structure is currently not in use and locked due to its poor and unsafe condition. This cone shaped structure was the windmill used to power the mill to grind sugarcane during its ingenio days. Cone shaped stuctures were typical in Ingenios as can be seen in the Ingenio Vives , Carlota , Santa Ana and Berdecía pages. We were also told by that person, that tracks used to run underneath the stairs leading to the laboratory building where the handcar was stored when not in use. The Puerto Rico Land Authority acquired Plazuela in 1946 and operated it until 1963 when it was dismantled and its machinery sold to Pansales Trading Corporation of Panama for $1.8 million. 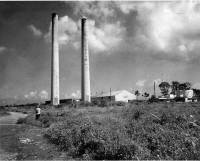 The site where the sugar mill was is now being used by the Barceloneta Municipal Government. As told by one of the employees, one of the smoke stacks have a Masonic sign near the top. The white building behind the laboratory dates from when the sugar mill was in operation and is now used as a warehouse.